The first six months of my life I cried incessantly. My mother was beside herself. She dreamt of me since she married my father five years prior in a ceremony she always complained about. The two of them, a justice of the peace, her in a simple frock. When I came along her world was becoming somewhat complete. Until I began my wail-fest that left her guilting me about it for decades afterwards. The only thing that consoled me was the bottle. And I wouldn’t even hold the thing myself. She had to hold it. As soon as the liquid emptied the glass and filled my little belly I began cooing and waving my arms at the ceiling like a stoner grooving to The Grateful Dead. Same thing happened as I got older and ate a piece of pie. Or doughnut. Or my grandmother’s coconut cake. 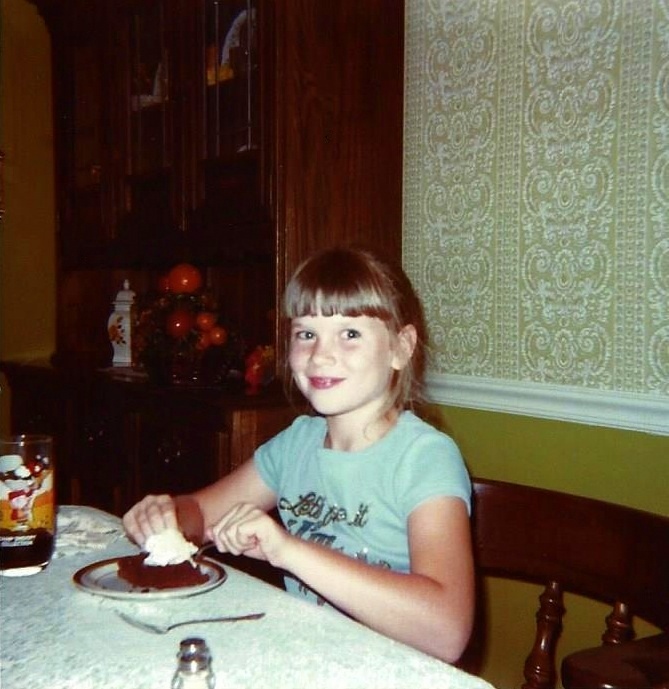 I have always had a sweet tooth. There are brownies baking in the oven as I type. But they are for the three fourth grade boys here playing Nerf war. I will longingly look at the pan, probably eat a few crumbs (cause as we all know crumbs have negative calories), and walk away. In high school I would come home and bake– brownies, chocolate oatmeal cookies, potato chip cookies, gingerbread, chocolate pie. But when I ended up eating half of what I baked I decided to get another hobby. Writing is sugar and gluten-free. When I was nursing my son I made up for all the ice-cream I didn’t eat while pregnant. I would have a large peanut butter custard shake every single day. But when the baby weaned and the pounds started creeping back I had to quit that hobby, too. Now the sweets are occasional indulgences. I do make a mean gluten-free dark chocolate chip cookie. The last pie I made was a “disaster” according to my mother-in-law as she shoved a handful of the crystallized chocolate into her mouth. I haven’t made brownies in at least ten years so I hope I can satisfy these hungry little soldiers. The house smells like chocolate cake goodness. Success. The brownies are not stuck to the edges of the pan and the boys just asked for seconds. I’ll scrape the remaining little shards and lick the knife. Then maybe just do a little hippie dance with a big grin on my face. If I go through all the trouble of making brownies, you better believe I’m eating one! I hear you though. :0) I’m forever pivoting between two worlds of “chunky belly” (yet sane) and “Dang- you’re 44? !” (and emotional and psychological instability from a lack of sugar-induced serotonin). Eat the brownie, Jen- eat the brownie!